You will earn 2311.00 bonus points. ? Express Your Sophisticated Taste Of Style With This Classic 3Pc.Sectional And Storage Ottoman Set. The Louis Has Been Elegantly Designed With Rolled Arms, And Accented With Antique Brass Nail Head Trim. The Soft, Leather Gel Treated Fabric That Has The Hand Of High-End Italian Leather Has Been Wrapped Over A Hardwood Frame That Is Corner Blocked And Glued For Extra Durability. A Sinuous Springs System Has Been Combined With Cushions That Contain 1.8 Density Foam That Sit Atop A Layer Of Pocketed Coils To Provide You The Ultimate Seating Comfort. 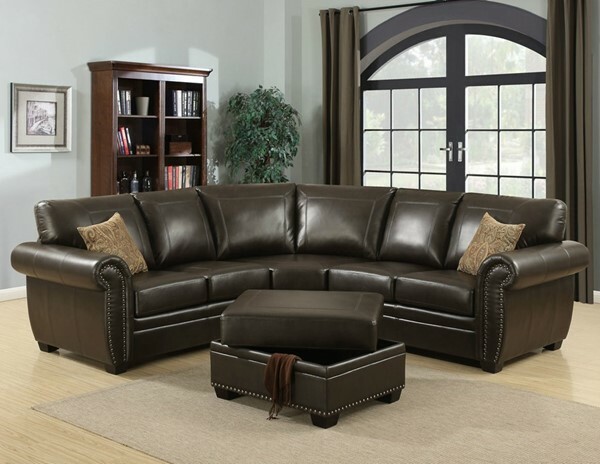 You Will Enjoy Entertaining Or Just Relaxing In This Traditional Yet Elegant Sectional In Our Louis Collection.